Hurst is thinking bigger for its next automotive offering. Rather than turning wrenches on the Camaro, Challenger or Mustang, Hurst has focused its attention to the 2011 Ram 1500 pickup. 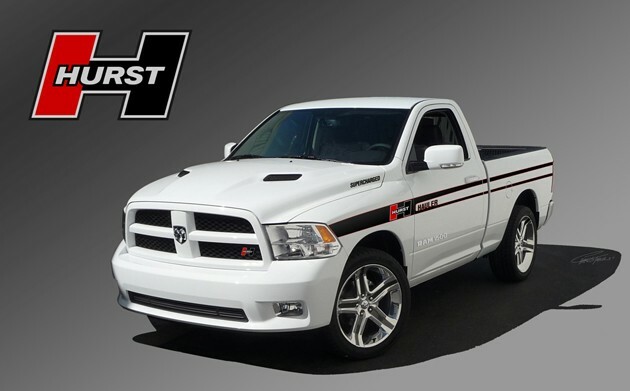 Starting with a 2011 Ram 1500 R/T regular-cab, Hurst adds its signature white-and-black paint scheme, badging, interior upgrades, Hurst colors on the factory 22-inch wheels, and a numbered dash plaque. Looks are only part of the package. Hurst adds power underhood by fitting a supercharger to the Ram's 5.7-liter Hemi V8, then adding a performance exhaust system. Unfortunately, we don't have any figures yet. We're anxious to hear what the Hurst Hemi Hauler is putting down to the pavement. Only 50 of these sport trucks will be built annually, and each comes with a letter of authenticity. No word yet on pricing, but expect to pay more than $50,000 and less than $100,000. Hurst super-sizes its efforts with 2011 Ram Hemi Hauler originally appeared on Autoblog on Sat, 05 Feb 2011 19:02:00 EST. Please see our terms for use of feeds.